lt;stronggt;CWNOXH035GYlt;/stronggt;lt;BR/gt;Crown Oxford Wiper Matlt;BR/gt;Beautifully designeda combination of performance and appearance like no other wiper An elegant solution for a good first impression. High performance mat retains water and minimizes the risk of slips and falls. Heavyweight loop pile mat that exceeds performance. 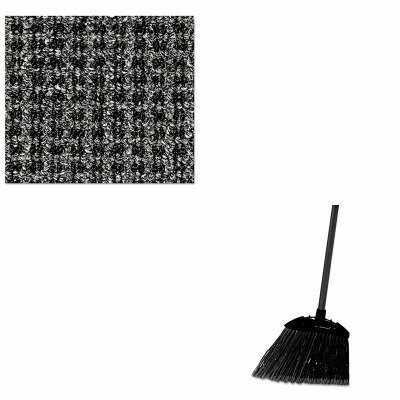 Attractive pattern hides dirt and keeps your entrances clean. Thermoflex vinyl backing offers superior floor protection. Mat Type: Wiper Mat Application: Indoor Entryway Materials: Loop Pile Polypropylene Fibers.lt;BR/gt;lt;BR/gt;lt;stronggt;RCP637400BLAlt;/stronggt;lt;BR/gt;Crown Oxford Wiper Matlt;BR/gt;Cut and shaped for easy sweeping in hard-to-reach areas. Flagged, acid-resistant polypropylene fill bristles. Will not stain, discolor or absorb odors. Can be used wet or dry. Overall length 35amp;quot;. Application: Spot Bristle Material: Polypropylene.